At Scooters Computers, we recognize that privacy and security of personal information is a concern to our customers. We have taken care in establishing and implementing policies and procedures to protect this information. We use IP addresses to analyze trends, administer the site, track user’s movement, and gather broad demographic information for aggregate use. IP addresses are not likey to contain personally identifiable information. The public portion of this Web site does not request any personal information or collect any information that personally identifies you or allows you to be personally contacted, other than the information you choose to enter in our Contact Me page. We do not share any personal information with any third parties nor do we use any personal information for any purpose not specifically requested by you. This site contains links to other sites. 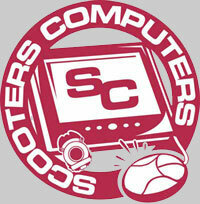 Scooters Computers is not responsible for the privacy practices or the content of such Web sites. This site has security measures in place to protect the loss, misuse, and alteration of the information under our control. We use standard and accepted methods of securing our site and the machine(s) that serve the site to the public. We continue to monitor and review the privacy measures we use to protect customer information. These measures are updated as practices change and new technology becomes available. If you have any questions about this privacy statement, the practices of this site, or your dealings with this Web site, you may email me.